The American Cancer Society estimates that 226,870 new cases of breast cancer will be diagnosed in 2012. Approximately 39,510 of those cases are expected to end in death. Receiving a cancer diagnosis is frightening. The future is uncertain and the fight is difficult, to say the least. Everyone deals with the grief of their discovery differently. Some make such a powerful statement, approach their fight with such grace, that others can’t help but be inspired by it. Breastfeeding support worker, Sara Duncan, discovered that she had breast cancer last September. Like most women faced with a diagnosis of cancer, Sara was grief-stricken. “The natural reaction is to burst into tears, but having got over the initial shock, you have to be positive,” Craig stated. And as grief gave way, Sara and her husband, Craig Etchells, are created a positive, empowering statement in a fight that is riddled with pain, hopelessness and despair. Right now, Sara is halfway through her chemotherapy treatments. Once that is completed, she will receive radiation treatments and then five years of hormone treatments. “The chemotherapy is having bad side-effects, but that’s a sign that it’s working,” Sara stated. Working chemotherapy often means a loss of hair – an experience that can be devastating for many women. “Your hair is your identity,” Sara shared. But instead of allowing the loss of her hair crush her, Sara and her husband Craig decided to make the experience positive. 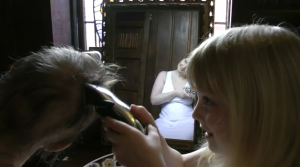 Sara allowed her six-year-old daughter, Lola Etchells, to cut her hair so that she could see what her mother’s hair would look like after the treatments were over. “They were both laughing in the film because Lola said, ‘You are going to look like daddy when I am finished – two baldies!’” Craig, who filmed the experience, stated. “Sara has smiled her way through it all and the biggest thing that’s kept her going are the children. They are the reason to get up in the morning and keep fighting. We’ve kept nothing a secret from them. That way it’s become part of their lives and they will understand it better,” Craig said. At first, the video was meant to serve as nothing more than a family momento for Sara, Craig and their six children. But after seeing how touched their family and friends were by the video, Sara agreed to post the clip on YouTube in hopes that it would inspire others. Good can’t even explain the impact that this family is having. 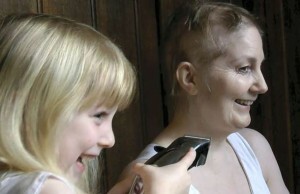 This intimate moment between mother and daughter has gone viral, inspiring many lives that have been touched by cancer. But Sara and Craig say they are just getting started. The couple hopes to create several films, documenting Sara’s fight, in hopes that these videos will continue to empower and inspire others who are fighting cancer. The couple hopes to raise £100,000 with their efforts. They plan to donate those proceeds to 10 different cancer charities.